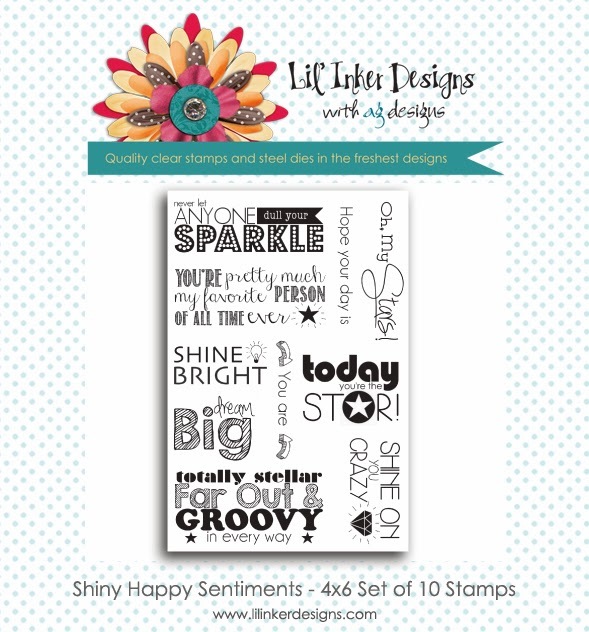 It's the final day of the December Release for Lil' Inker Designs! I hope you enjoyed seeing the release. 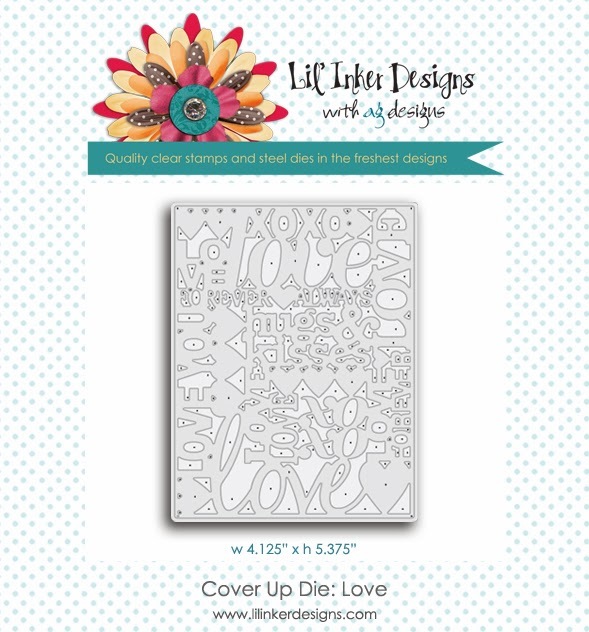 If you are following the hop, you should have arrived from Jen's Blog, although the complete line-up and details can be found at the Lil' Inkers Design Blog. 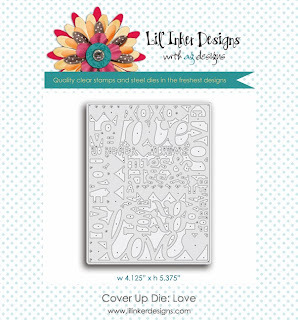 My final project features the Love Cover Up Die. I just "love" this line of products! 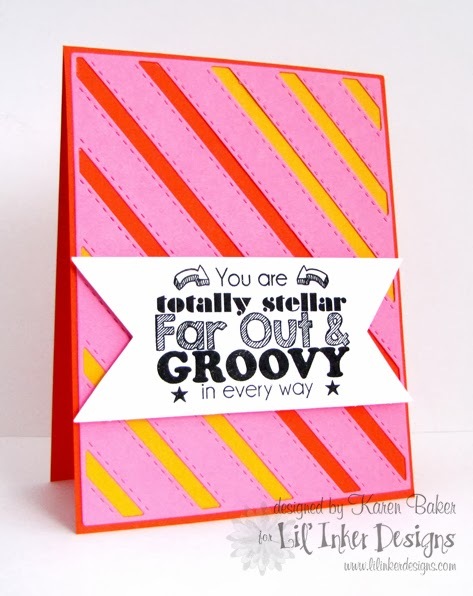 So easy to make a simple card, and so easy to dress it up for a more detailed card too! I started by die cutting from peach paper the Cover Up. I adhered this to a slightly darker cardstock panel. Then I ran the Die through two more times, one with white cardstock and then with some patterned paper. 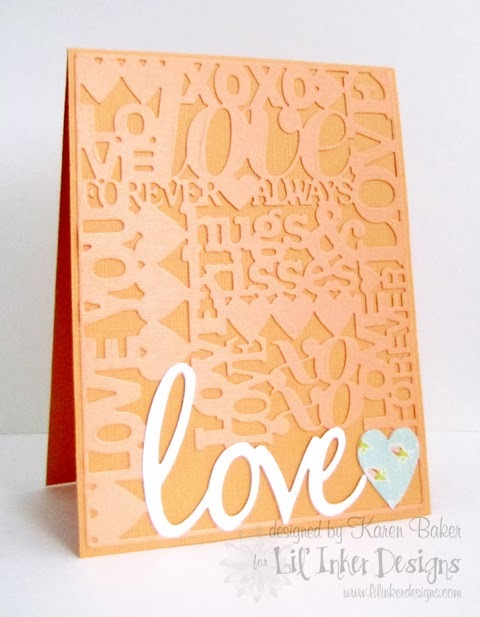 I selectively cut the word Love from White and the heart from the patterned paper and adhered them to the card as well, on top of the existing peach color. 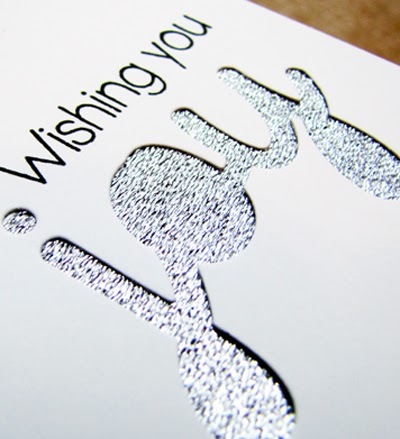 I hope you enjoy hopping through to the Lil' Inker Designs Design Team Blogs. Remember to leave comments, for a random winner will be chosen to win a gift certificate! Your next stop is Sarah! Did you enjoy yesterday's projects? 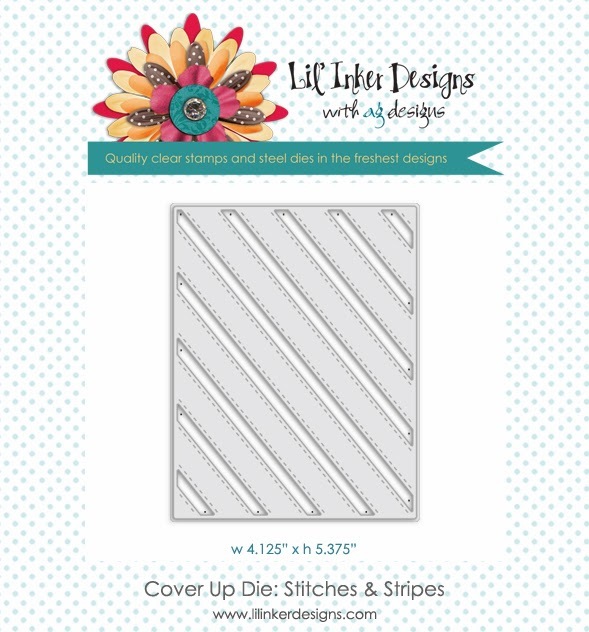 Today is the second day of the December Release for Lil' Inker Designs! 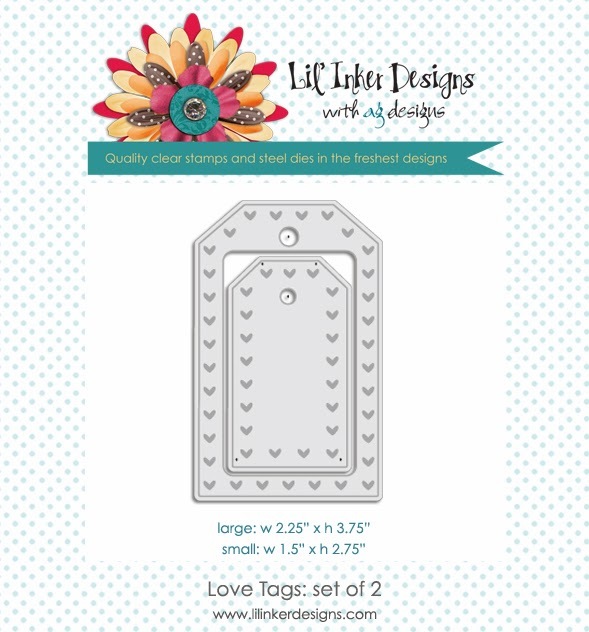 If you are following the hop, you should have arrived from Jen's Blog, although the complete line-up and details can be found at the Lil' Inkers Design Blog. 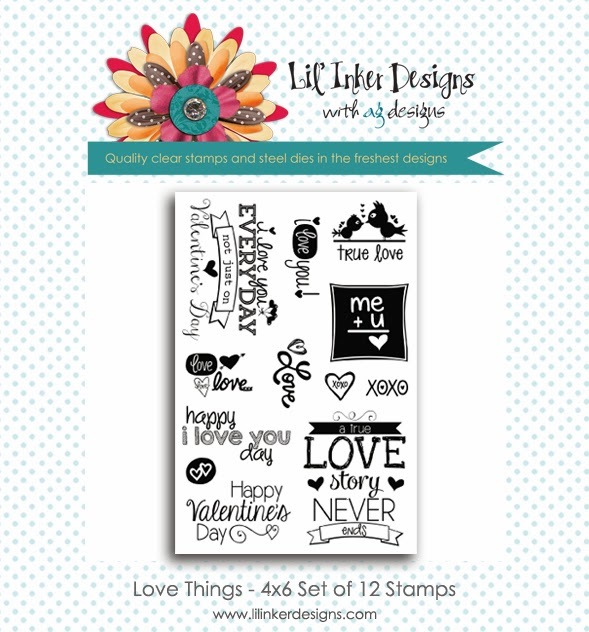 My first card today showcases the fun new Love Tags Die Cuts. 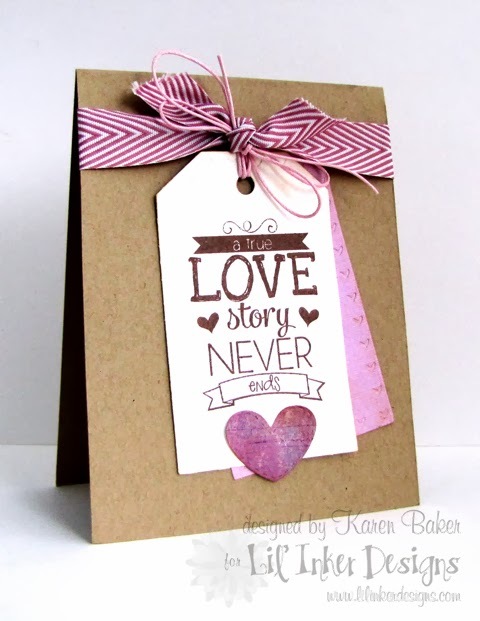 (It also features embossing of a little hearts border which is so sweet!) I die cut two tags, one from purple and one from white. 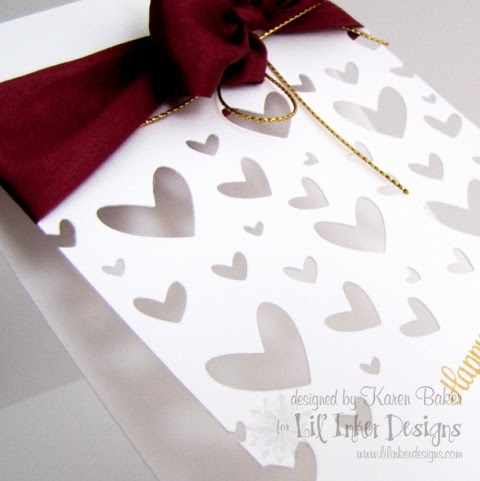 I stamped a greeting from the new Love Things Stamp Set, designed by Laura, onto the white tag and added a die cut heart from a previously released product, Of the Hearts Die. I adhered the tags to a kraft card base with May Arts 3/4" Purple Chevron Twill Ribbon and Pink Waxed Cord. 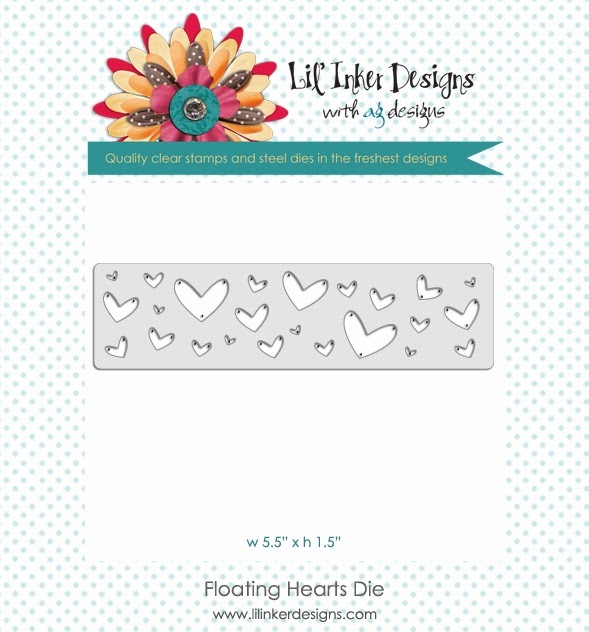 Then my next card features the fun, newly released, Floating Hearts Die. I started with a white cardstock panel. I placed the die at an angle and ran it once through my die-cutting machine. I then moved the die up and ran it through again, at the same angle. I folded the card in half, stamped a sentiment from Flags & Tags, and finished the card with a May Arts Burgundy Silk Ribbon bow and Gold String Bow. 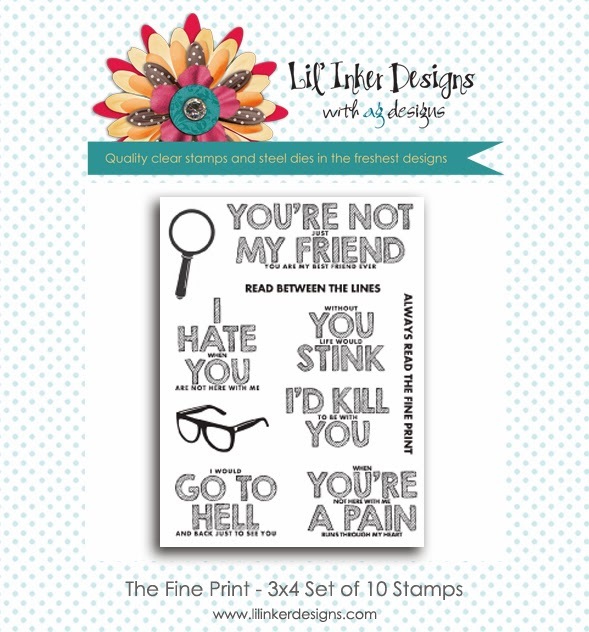 With two growing boys in the house, I often times find myself reading between the lines, trying to figure out the true meaning of their stories...Today is the first day of the December Release for Lil' Inker Designs and yet again, there is a fantastic line-up of products being released! If you are following the hop, you should have arrived from Jen's Blog, although the complete line-up and details can be found at the Lil' Inkers Design Blog. 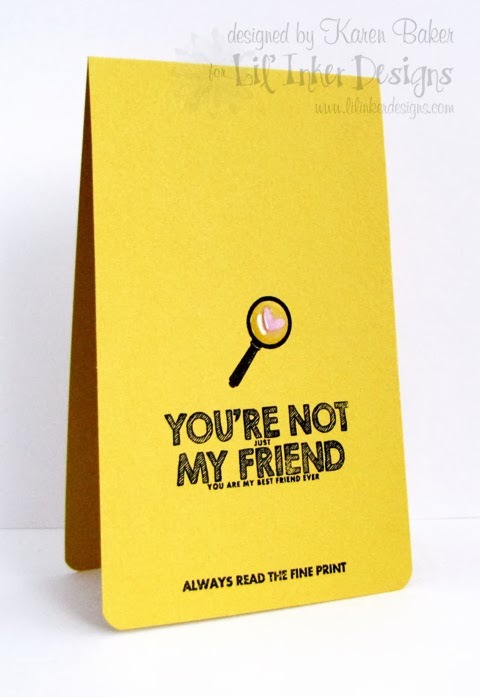 The first product I'm showcasing is this hilarious set designed by Laura. It is called The Fine Print. I stamped two of the sentiments onto a skinny cardstock base, stamped the magnifying glass, added a punched heart and some glossy accents. My next card features two new products! I went for a bold, graphic and FUN look for this card. I started by die-cutting with pink cardstock a panel with the Cover Up Die: Stitches & Stripes and before adhering it to the bright orange card base, I glued yellow cardstock under the pink panel in selective areas. This was so easy and simple to do, and I can only imagine the fun color combinations and designs one can come up with! To finish the card, I stamped two sentiments from the Shiny Happy Sentiments Stamp set, designed by Laura, onto a handcut banner and ahdered it to the card with dimensional adhesive. Have you checked off all your names on your Christmas List yet? The May Arts Ribbonistas have a whole lotta Handmade Christmas Gifts inspiration for you today with their Handmade Christmas Gift Hop! I made some custom, chic bobby pins for my Handmade Christmas Gift, with the help of May Arts Ribbon and our Partner in Craft, Imaginesce. 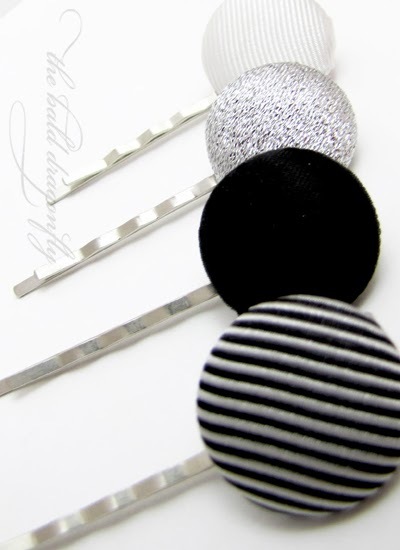 The ribbons I choose for this coordinating collection of hair accessories were May Arts 2 Toned 1.5" Grosgrain Ribbon in Black/White (EH10), 2" Two Tone Satin Reversible in Black/White (446-2-10), 1.5" Silver Metallic (464-15-31), and 1.5" Grosgrain Ribbon in White (QH01). 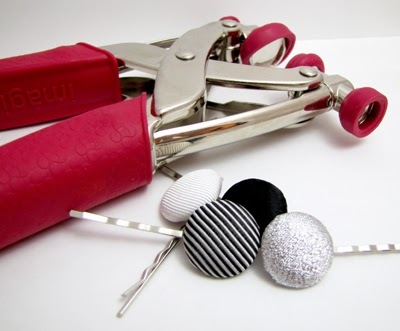 I used the i-top tool and snap daddies with bobby pin accessories to make the pins. Such an easy process-just make sure to choose wide enough ribbon to be able to tuck your ends under! 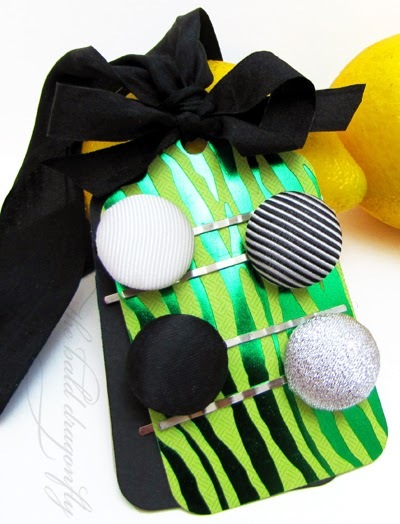 (For this side of button, I chose 1.5" inch or wider ribbon). I dressed up the gift with a handmade tag using another Partner in Craft product, DCWV, Inc.'s Metallic Paper and some 1.25" Black Silk Ribbon (SK10) and 1/2" Solid Black Wrinkle Ribbon (EA10). Here's the hop line-up, but of course, please be sure to visit the May Arts Blog as well! I don't think there is any object out there that doesn't pair well or work well with May Arts Ribbon. I'm pretty particular when it comes to adhesives I use, especially when working with ribbon on cards, and I love how Scrapbook Adhesives products adhere the ribbon. 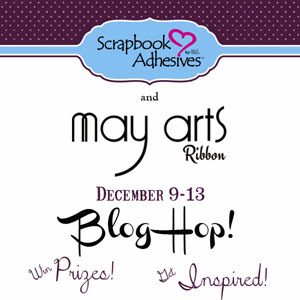 May Arts has teamed up with Scrapbook Adhesives this week for a fun blog hop, it is the second day of inspiration. Complete details can be found on the May Arts Blog. My first card features some luscious satin ribbon in the traditional Christmas Colors. 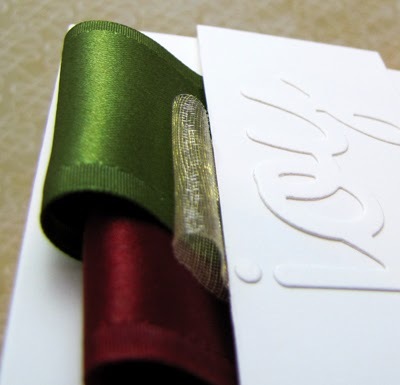 I laid a line Scrapbook Adhesives' Crafty Power Tape on my card base and then made some long ribbon tabs with May Arts' 1.5" Satin Grosgrain Edged Ribbon in Olive (HN16) and Burgundy (HN25). Then I looped and layered a length of the 1" Sheer Gold Ribbon (C30) on top, also adhering that with the Power Tape. 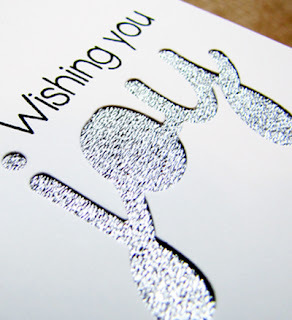 I finished the card with a die cut word (Lil' Inkers Designs Joy Word Die) adhered with E-Z Dots onto a white panel. 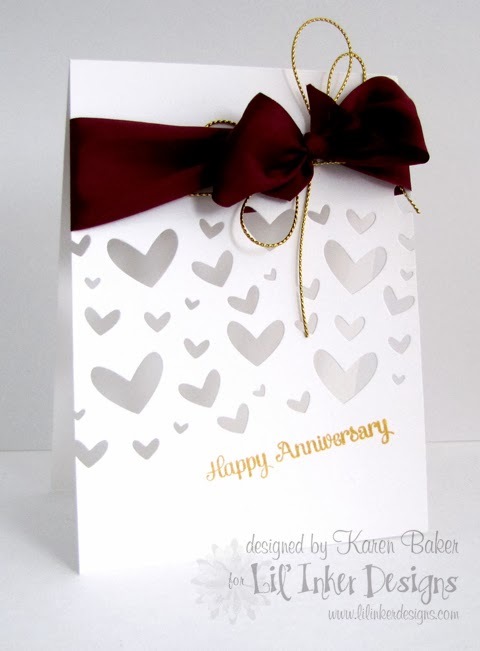 The panel itself was affixed to the card with Scrapbook Adhesives' foam squares. 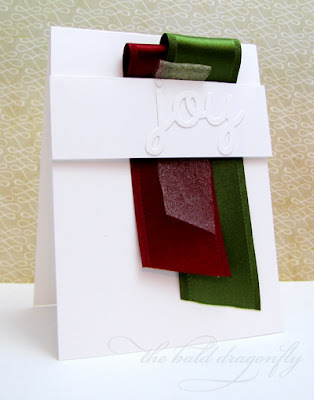 My second card is sleek and contemporary, and so easy to put together! 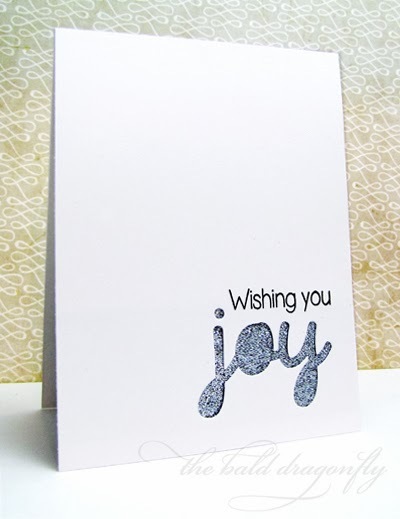 I die cut the word from a white card base and stamped the sentiment (from Lil' Inker Designs Jolly & Joyful Sentiments). Then I adhered a 4.25" length of the amazing May Arts 1.5" Silver Metallic Ribbon (464-15-31) to a panel with Scrapbook Adhesives' Crafty Power Tape and then affixed the panel with the Tape on the underside of the card front.